Cutout sugar cookies are pretty fantastic. But they're even better when cut out into unicorn shapes. While technically, none of the ingredients are altered from a cutout cookie that could be used to cut out circles, hearts, or stars, it is pretty much scientific fact that shaping your cookies like unicorns adds enough magic to heighten your eating experience. Believe it or not, this recipe is adapted from an early Girl Scout Cookie recipe. It seems that in the early days of the cookie-fundraiser, the scouts actually made the cookies themselves, with their moms, for a merit badge. Well, certainly they found that their time was better spent selling than baking, judging by the flocks of the scouts who sell cookies by grocery stores each spring. Nonetheless, it's fun to taste these not-overly sweet, good basic cutout cookies and imagine them being sold at one of the first Girl Scout Cookie sales in the earlier part of the 1900s. Just be sure to let the dough chill before rolling, and roll in small batches and keep the remaining dough in the fridge, otherwise they will spread too much and will not keep their shape! 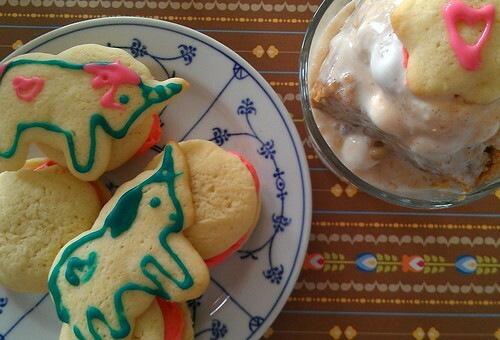 Oh, and you can buy a unicorn cookie cutter here. In a medium bowl, sift together the flour, salt, and baking powder. In the bowl of a stand mixer fitted with the paddle attachment, cream the butter and sugar until light and fluffy, about 2-3 minutes on high speed. Add the eggs, one at a time, pausing to scrape down the sides of the bowl with a rubber spatula after each addition. Add in the milk, alternately with the flour mixture, in 2-3 additions. Form the dough into 2 balls. Cover tightly in plastic wrap. Refrigerate for at least 1 hour or up to overnight. On an extremely well-floured work surface, using a floured rolling pin, roll out the cookies. 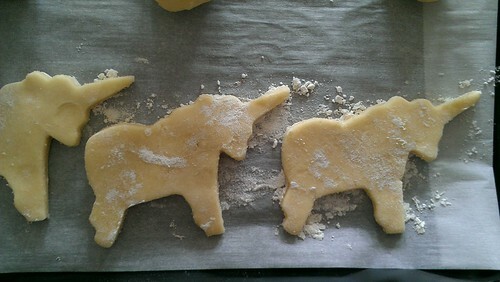 Use your unicorn cookie cutter to cut out cookies. Transfer to your prepared sheets using a spatula. Bake 8 to 10 minutes or until the edges begin to brown.